Window wells. Steel window well cover. Plastic window well cover. Steel basement window well covers as shown to the far left, are made of heavy duty steel. They should be installed in people traffic areas such as patios and walkways. All window wells should have a cover in areas where small children are playing such as backyards. 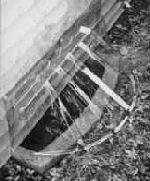 Plastic window well covers as pictured, are easy to install. Just make sure that they are snug fitting against the wall and cover the entire well.